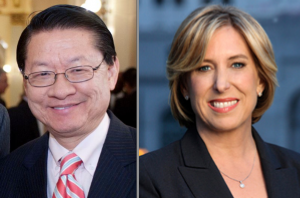 Mike Eng, recently elected as a trustee of Los Angeles Community College District, has endorsed Controller Wendy Greuel for mayor of Los Angeles. Greuel announced the former assemblyman’s endorsement on Monday. Greuel’s endorsers also include Eng’s wife, Rep. Judy Chu (D-Pasadena), chair of the Congressional Asian Pacific American Caucus, and more than 30 Korean American community leaders, including former Irvine Mayor Sukhee Kang and Korean American Coalition Executive Director Grace Yoo. Greuel is in the May 21 runoff for mayor with City Councilmember Eric Garcetti, whose Asian Pacific American supporters include musician Steve Aoki, Pacific American Volunteer Association founder Tiger Kang, Hudson Jeans CEO Peter Kim, actor Kal Penn, and more than 60 Filipino American community leaders, including Assemblymember Rob Bonta (D-Oakland), Los Angeles Human Relations Commissioner Melany De La Cruz-Viesca, Board of Fire Commissioners Vice President Casimiro Tolentino, and SIPA (Search to Involve Pilipino Americans) Executive Director Joel Jacinto. The third- and fourth-place finishers in the March 5 election, Kevin James and Councilmember Jan Perry, have not announced whether they will endorse a candidate. Don’t forget that Garcetti has been endorsed by over 60 Filipino American community leaders. Okay, that paragraph has been revised. Thank you for making that correction about the deep support that Eric Garcetti has amongst Filipino stakeholders.